As you grow up in life your family may introduce you to some belief or faith. No matter what demonination you are raised, these beliefs may raise questions in your mind or doubts as to the existence of that belief. The Catholic Repertory production of Doubt and Agnes of God proves this to be true and illustrates that no matter how strong your faith, there is always some hesitation of what to believe, or what is real and not real, or “doubt”. These two productions that were produced into one evening of theater were no small challenge for actors Kate Skinner, Sadieh Rifai, and Penelope Walker. Lance Baker was only in the production of Doubt. However, each actor was able to successfully portray their character to make the audience believe that they were who they were portraying. Doubt is a story of a parochial school’s principal, Sr. Aloysius; who is the epitome of everything you heard about and feared with some catholic school nuns. She is suspicious, strict, unreasonable, and a little evil. The students are terrified with her, where she says, “ Fear,That’s how it works” and she is fine with that. Sr. Aloysius is very suspicious and angry with Father Flynn, the parish priest, and his relationship with the male students at the school. She had a dislike with Fr. Flynn from the time he came to the parish. Sr. Aloysius is so certain that something inappropriate is going on she enlists the assistance of one of the school sisters, Sr. James; to help her with her mission to get rid of Father Flynn. The interaction between the characters, made a strong case for Sr. Aloysius suspicions. Although, in listening to Fr.Flynn’s explanations, they were also very believable. Sr. James was put in this predicament where her superior is telling her that Fr. Flynn is doing something wrong by giving a male student, Donnie Muller altar wine to seduce and sexually abuse him. Then Fr. Flynn comes up with a logical explanation where the innocence and sweet forgiveness of Sr. James comes out. Who does Sr. James believe? Sr. Aloysius brings in Mrs. Muller, played by Penelope Walker, to fill her in, and to assist her with her contemptible mission to get rid of Fr Flynn. Mrs. Muller, who is African American, explained to Sr. Aloysius, that all she wants for her son Donny, is for him to complete the 8th grade so he can go on to a good high school, and onto college. Unfortunately, some of this is still true today as it was in the early 1960’s. It was very difficult for a minority to find a good school in the city, where a private school may be a better choice for a better life. Mrs. Muller’s goal for her son is to be a success and to remain safe doing so, no matter what the price. Kate Skinner’s interpretation of Sr. Aloysius was very accurate and very believable where the audience is a bit fearful. Being raised a Catholic and going to Catholic school in the 1960’s, I can tell you there were nuns like Sr. Aloysius where all of us at the school feared for our lives. Her motto was, “Be hard on the bright ones, don’t be charmed by the cleverness”. I know it makes no sense but not much did during that time. However, in the first scene, I saw a little of Dana Carvey’s “ Church Lady” come out, which thankfully went away by the 2nd scene. That part wasn’t all that special. The next scene and for the reminder of the play Kate Skinner remained with the character of Sr. Aloysius and continued to do a brilliant job doing so. On the other hand, Sadieh Rifai who played Sr. James was the complete opposite of Sr. Aloysius. Sr. James was kind, had love in her heart for everyone, wanted the students to explore knowledge and beauty rather than discipline and fear. She was accused by Sr. Aloysius of being “too touchy feely”. Ultimately, Sr. Aloysius took away Sr. James joy of teaching. From my experience from grade school I have met both of these types of nuns. Kate Skinner and Sadieh Rifai were Sr. Aloysius and Sr. James. Lance Baker, who played Father Flynn, made you believe that you were in church listening to a sermon. When the sermon was completed, and Lance made the sign of the cross I saw members of the audience who were probably Catholic, do the same, including me! Fr. Flynn came across as the likable priest that wanted to be there for the children, a positive role model like Bing Crosby in Going my Way. His love and devotion to providing a positive role for the children made him likable and believable. Fr. Flynn’s explanation for Sr. Aloysius accusations was also believable. Although, you could see the torment he was going through in trying to prove his innocence and that he deeply cared for the children and that he did not agree with Sr. Aloysius contemptible behavior. Lance Baker was successful in creating the loving tormented priest. The stage, lighting and the sets at the American Theater Company for Doubt were excellent. The scenes in the court yard made you believe it was a brisk fall day, with all of the leaves on the ground. The scenes in the church and in Sr. Aloysius office made me believe I was back in my parish growing up revisiting those places. My only concern was probably more with some direction. This production did not portray the male dominance over the sisters as it did in the movie, or in life. If you speak to any Catholic who was in a Catholic school during the 1960’s, you would know that the nuns would never over step their bounds with the parish priests and that there was always this superiority over the nuns and they had to be obedient. This production did not show that. In the 2008 movie with Meryl Streep I remember this scene where the nuns are eating this modest dinner with a glass of milk, and then it flashes to the rectory where you see the priests dining at a table with linen, a glass of wine and a filet. That is the way it was during that time. It was a time of male superiority and chauvinism. This was not depicted in this production, which I think would have brought a better understanding of the culture priests and nuns during that time. This would have also depicted the inappropriate power struggle between Sr. Aloysius and Fr. Flynn. At that time this communication between an obedient nun and a parish priest was forbidden. However, in my opinion, it is a small oversight for a first rate production. Doubt is a wonderful work with strong actors, and is a must see no matter what your belief. During this time of all of the scandals with the Catholic Church concerning the abuse of young boys, it is easy to place blame on those abusers. However, could you have any doubt with any of these occurrences? I know that I do. At the end of Doubt, I really still did not know who to believe. So the same is true in real life. I guess that is where we have to follow our hearts and consciences. In Agnes of God, belief comes into the picture again when a nun, Sr. Agnes gives birth to a baby that is brutally found murdered in a wastebasket, and a court appointed psychiatrist is brought in to learn exactly what happened. Why was there a baby, and why did it die? 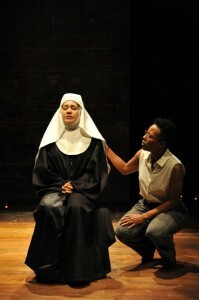 The Mother Superior is with Agnes to protect her from the truth and from herself. Was this a deliberate act or was this an act of a very mentally sick young woman who is not fully aware of what is real? The story portrays all three women who have secrets that are either deliberately kept confidential, or are held back through some psychosis. The audience is there to determine through brilliant acting of what is true and what is real. Sr. Agnes, played by Sadieh Rifai, came to the convent at the age of 17 shortly after the death of her mother. Her mother kept her home never letting her out until she died and Agnes was sent to the convent. We later find out that her mother was abusive to Agnes. At the convent we learn that Sr. Agnes either has a strong relationship with God and her vocation, or she is totally insane. It is probably a little of both. Sr. Agnes walks through the halls singing various chants and hymns and claims that Maria or the Blessed Mother is singing through her, and that the singing is not coming from her. From the beginning Agnes has no recollection of how the baby was conceived or born. Dr. Marsha Livingston, who is played by Penelope Walker, is the court appointed psychiatrist who is sent to figure out how this innocent nun could be impregnated then kill her baby. The audience also explores facets of Dr. Livingston’s life where she has an axe to grind against Catholicism. Dr. Livingston has lost faith in God and has led her to have difficulty in believing the stories that she is being told by the Mother Superior and Agnes. Dr. Livingston struggles with her lack of faith and the clinical explanations she must use to prove Agnes innocence. Mother Miriam Ruth, who is played by Kate Skinner, is the Mother Superior who tries to protect Agnes against the constant questions from Dr. Livingston who is trying to learn the truth. Mother Miriam Ruth believes that Agnes is touched by God and she is not insane. The Mother Superior is very strong with her authority which Dr. Livingston will not be a part of. Without giving away too much of the ending, Dr. Livingston is able to learn the truth through hypnotizing Agnes and ultimately pulling out more hidden information from the Mother Superior as to what actually happened when the baby was conceived and after the baby was born. The portrayal of all three of these women was so different from their portrayal in Doubt. But none the less, very strong in their depiction, as they were in Doubt. Kate Skinner’s Mother Miriam Ruth was a strong, in control nun that had the compassion that Sr. Aloysius did not have. Mother Miriam Ruth’s strength was more compassionate without the contemptible meanness of Sr. Aloysius. She was more like the Mother Abbot in the Sound of Music, with a secret. Penelope Walker as Dr. Livingston was strong and in control as a doctor trying to help her patient, in contrast with the desperate mother trying to do the best for her son and keep him out of harm’s way. Finally, Sadieh Rifai’s depiction of Agnes illustrates a troubled woman with a troubled past who has a strong faith in God, because that is really all she has. In Doubt, Sadieh portrays a kind loving nun with a certain amount of weakness, but in control. The innocence of both Agnes and Sr. James are wonderfully portrayed by Sadieh Rifai. In fact, all three women did a beautiful job in portraying their characters for both productions. The direction, sets and lighting for Agnes were all very good. The actors were excellent and believable. Both productions moved relatively quickly considering that Doubt was 69 minutes long and Agnes of God ran for 76 minutes with a 20 minute intermission between both productions. Both Doubt and Agnes of God held my interest without getting bored. I once again got the feeling that I was in a stoic convent with the dark halls and candles. Both stages for both productions were simply done, which is all that is adequately required. The American Theater Company has a wonderful space, and The Catholic Repertory used the space very wisely for both productions. Catholics and non-Catholics would really enjoy both productions as I did. It was truly a wonderful evening of theater without any doubt! Fury Theatre Presents "A Christmas Carol: An Evening of Dickensian Delights"